i. Adam hat im Paradies. Christmas. 1700, as above, p. 71, in 8 stanzas. In the Unverfälschter Liedersegen, 1851, No. 23. Translated as "Adam did, in Paradise." By Miss Manington, 1864, p. 21. 1. God of Ages never ending, Ruling. A good translation, omitting stanza iii., by H. J. Buckoll in his Hymns from the German, 1842, p. 5. His translations of stanzas i., ii., vi. were repeated in the Dalston Hospital Hymn Book, 1848; the Rugby School Hymn Book, 1850 and 1876, and others. 2. Great God of Ages! by whose power. A translation of stanzas i., ii., vi. as No. 10 in J. F. Thrupp's Psalms & Hymns, 1853. 3. God of Ages never ending! All creation. A good translation of stanzas i., ii., vi., based on Buckoll, con¬tributed by A. T. Russell to P. Maurice's Choral Hymn Book, 1861, No. 466. 4. God of Ages, great and mighty. A translation of stanzas i., ii., v., vi. by C. H. L. Schnette, as No. 291 in the Ohio Lutheran Hymnal 1880. (1) Lord, on earth I dwell sad-hearted. A good translation, omitting stanzas iv., v., by Miss Winkworth, as No. 66 in her Chorale Book for England, 1863; repeated in the Ohio Lutheran Hymnal, 1880. Another translation is (2) "Lord, on earth I dwell in pain." By Miss Winkworth, 1855, p. 106.
iv. Mein Gott, nun ist es wieder Morgen. Morning. 1700, as above, p. 871, in 6 stanzas, and in the Berlin Geistliche Lieder ed. 1863, No. 1119. Translated as "My God, again the morning breaketh." By Miss Manington, 1863, p. 118. 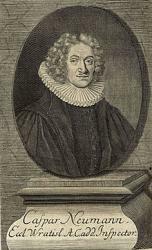 Caspar (or Kaspar) Neumann (14 September 1648 – 27 January 1715) was a German professor and clergyman from Breslau with a special interest in mortality rates.